Plywood was the first type of engineered wood to be invented. It is made from thin sheets of wood veneer, called plies or veneers, which are stacked together with the direction of each ply's grain differing from its neighbors by 90° (cross-banding). The plies are then bonded under extreme heat and pressure with strong adhesives, usually phenol formaldehyde resin, making plywood a type of composite material. A common reason for using plywood instead of plain wood is because plywood is more stable and because it is less prone to change (shrink, twist or warp) even in rough weather conditions. 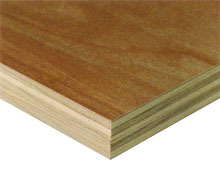 Indoor Plywood generally uses the less expensive phenol-formaldehyde glue (which has limited water resistance), while outdoor and marine grade plywood are designed to withstand rot and use a water resistant phenol-resorcinol glue to prevent delamination and retain strength in high humidity. Common varieties of softwood plywood comes in three, five or seven plies with dimensions of 1.2 m × 2.4 m (4 feet × 8 feet). Each ply is 1/8 inch. Roofing can use the thinnest 3/8-inch plywood. Floorboards are at least 5/8-inch depending on the distance between floor joists. Plywood is often tongue and grooved for flooring applications. Two of the edges will have "grooves" notched into them to fit with the adjacent "tongue" that protrudes from the next board. To find out more about the products that we offer, please don't hesitate to contact one of our qualified sales representatives at 1.800.343.6394 today.